Reviews: Korg Grandstage, Royer R‑10 Ribbon Mic, Synthogy Ivory II Studio Grands, Hammond XK-5, Warm Audio WA-412, Cinematic Studio Solo Strings, Newfangled Audio Elevate, Soundelux USA U99, IK Multimedia Syntronik. 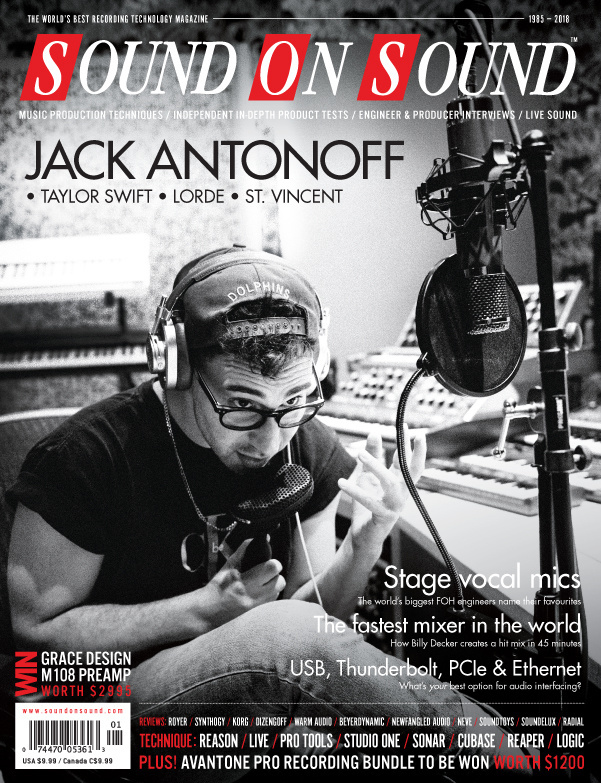 Techniques: Jack Antonoff, Vocal Microphones For The Stage, Inside Track: Mixing Chris Young, Making Modern Metal Part 1, Computer Connectors guide, Protocols & Audio Interfaces. These classy new stage mics sit at opposite ends of the tonal spectrum — so if one doesn’t suit you, the other probably will. Celestion have made available impulse responses for a wide range of their classic speakers mounted in 1x12, 2x12 and 4x12 cabinets, and miked with appropriate single or double mic arrays. Cinematic Studio turn their sampling expertise towards a quartet of solo strings. Cinematique Instruments have released a small number of titles based upon the Ensemblia engine, and featuring different niche sound sets, and their latest is Ensemblia 2 Percussion. Earthworks have long been renowned for their top-tier instrument mics, but their latest offering is aimed at capturing vocals. Pairing EHX’s impressive ‘freeze’ technology with a multi-effects processor opens up a world of creative possibilities. Designed for stage hands, road crew and those of us who have to lug our own gear to gigs, Gig Gloves aim to provide hand protection combined with flexibility and the ability to grip well. All loudspeakers, whether active monitors or guitar/bass amps, tend to exhibit cabinet vibrations. We test this new stand-alone isolating ‘puck’, designed to minimise unwanted colorations from structure-borne vibrations. Bored with plain old Sample & Hold? We check out the updated Turing Machine MkII along with the new Pulses and Volts expanders. A new processor from a new developer promises limiting and transient control precisely targeted to the needs of an individual mix. Radial’s innovative Key Largo is designed to sit at the heart of your live keyboard rig. Soundelux are back with another premium valve microphone — this time a modern interpretation of the venerable Neumann U67. Synthogy continue to do what they do best, with another pair of stellar virtual pianos. Motors is a collection of rhythmic pulse sounds with tools to blend two of these — plus a whole range of sound modulation and effects options — to create all sorts of rhythmic beds. Torque lets you retune a drum that’s already been recorded, but without introducing the artifacts that simple pitch-shifting always seems to throw up. We delve into the mysteries of granular synthesis with Max For Live’s Granulator II instrument. Keeping up with the Nashville music world means working fast — and few mix engineers work as fast as Billy Decker! Create, recall and control complex effects chains and routings with Logic’s Smart Controls and Track Stacks. In this three-part series, we follow the painstaking production of a metal album, all the way from rehearsals to release. We get to grips with Grain, Reason 10’s versatile new granular synth. Reaper’s Track Templates facility allows you to store and recall far more than a list of insert plug-ins! Get the most out of Groove Clips in Sonar. To attract talent from around the world, Johann Scheerer has created an interactive online tour of his world-class Clouds Hill Studios facility in Hamburg. In this month’s SOS video feature, Johann and his team explain how they used virtual reality and immersive audio to bring the studio’s unique ambience to life. If you make and record music using computers, as most of us do, you rely heavily on technology and have to come to terms with the fact that things can sometimes change more quickly than you might like. Are Black Friday sales really such a good idea? Media content for the January 2018 issue.